To plan and manage a vibrant Culture Night, anchor the ideas in social studies curriculum, involve the community, and make sure there's food! If you want to know how to host a great Culture Night at your school, borrow a play from the playbook of Walt Disney Elementary in Mishawaka, Indiana. To cast a spotlight on the richness of their wonderfully diverse community, this school has hosted a Culture Night every May for the past 16 years. "Every year we try to add a new element as our school and the event evolve," says faculty coordinator and music teacher Robi Davidson. "This is the event at our school that makes me most proud to be a teacher at Walt Disney." "It really brings our learning community together," says assistant principal Ryan Towner. "At Disney, we speak 23 languages. Most of our families live in nearby apartments and don't always get enough opportunities to interact with one another at school. But on Culture Night, our school community turns out. It's an opportunity to be unified by pride in our children and to celebrate all the richness and benefits we get from being such a diverse community." The school's extraordinary celebration of cultural diversity didn't evolve overnight. Here are a few lessons that the community has learned along the way. 1. Let your ELLs shine! Disney's staff makes a concerted effort to ensure that their English-language learners feel like the experts during Culture Night. Last year, the ESL specialist interviewed the school's ELLs and made a video that ran in a loop all evening. ELLs explained how to say hello and count to ten in their native languages, and described what school is like in their countries of origin. Food is a feature of just about every Culture Night, but here they invite the district's food services to join in on the excitement. The cafeteria features specially designed international lunches during the week leading up to the event. It's yet another way to remind students and parents that Culture Night is not an event to be missed. 3. Show off student learning. Each grade level contributes something for every regional display. A big pull for parents is that they know they'll have the opportunity to see multiple examples of student work throughout the building. It's obvious from the regional displays that teachers take a highly cross-curricular approach to creating the artifacts that they share. Exhibits have included examples of learning in art, music, social studies, language arts, and math. As an example, check out this lesson plan for teaching geometry through Islamic art from the Metropolitan Museum of Art. Part of what makes Disney Elementary's Culture Night so successful is that there's always so much to do and see. In years past, they've invited Irish dancers, Jamaican drummers, and other performers to entertain the crowd. The school taps families in the community to host the food and craft tables. The staff sets up the tables and chairs in the cafeteria, and the families do the rest -- cooking, decorating, teaching. etc. Teachers and administrators know that they have to reach out in a multitude of ways. Flyers go home with students, the ESL specialist explains the event to linguistically diverse families, reminders follow the flyers home, and phone calls are made. One especially creative communication effort is a series of morning announcements by students. The fourth-grade classes create one-minute morning announcements based on their country report projects. Each morning during the weeks leading up to Culture Night, the entire school gets to hear about some of the many countries that will be featured at the event. 8. Give participants a mission. 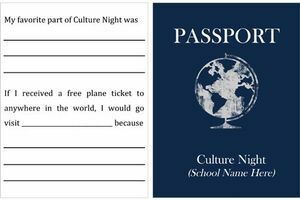 Upon arrival at the school on Culture Night, students receive a passport that they can complete and turn in for a prize drawing. They earn a stamp for completing an activity in each region. This encourages everyone to try new things and circulate through all of the regional displays. See a passport template below. 9. Celebrate U.S. cultures, too. It's easy for kids to fall into the trap of thinking that only people from countries outside the United States have culture. Culture Nights are an important opportunity to underscore that we all have cultures. Disney Elementary addresses this at its Culture Night by ensuring that the U.S.A. is a highlighted region. Fifth-grade classes create a large exhibition composed of their 50 States Projects. Each student chooses a state to research, creates a poster presentation, and designs a float to showcase the state. Winners are announced and ribbons distributed as part of the evening's events. 10. Name a faculty coordinator. Parent involvement is a must for any good Culture Night. But faculty buy-in is equally, if not more, important. 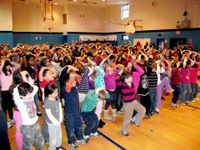 The faculty here found that appointing a teacher or staff member to help coordinate the event has improved communication and increased school-wide support. One of the greatest reasons for all of us to organize a multicultural celebration at our schools is the opportunity it offers students, teachers, and families to encounter one another in celebration of what we all bring to the table. It's an occasion to have fun while strengthening the academic connections to students' knowledge, background experiences, and ways of viewing the world. 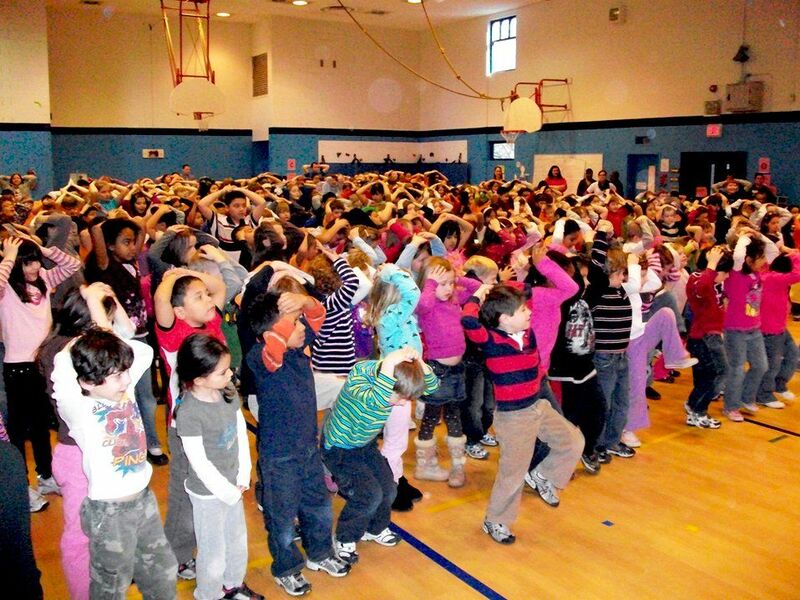 Take your inspiration from Walt Disney Elementary and plan a Culture Night at your school. And if you school already celebrates a Culture Night or some similar event, what can you learn from it?